Staining concrete has become a very popular means of transforming the traditional concrete slab into an artistic or architectural statement. Sometimes referred to as "colored concrete," builders and home owners alike are attracted to the many unique looks that stained concrete can create, both indoors and outdoors. Advancements in pigments and acid stains for concrete now allow skilled contractors to bring nearly any color mix imaginable to life through combining colors and different application techniques. Indeed, the outcome is limited only by the creativity and imaginations of those who administer the stained concrete process. There are several ways to create the color and effects that can be achieved through stained concrete applications. Concrete's porous qualities and neutral tone make it an excellent "blank canvas" for topical color applications. Acid-based chemical stains have allowed skilled decorative concrete contractors to create beautifully rich color pallets that resemble many types of natural stone, slate, granite, marble, wood, and even leather. Through custom color design, homeowners and commercial builders can devise uniquely custom looks for indoor concrete floors, unique concrete driveways, patios, walkways, pool decks, retaining walls and more. It is important to note that color integrated during the concrete mixing process is in the form of pigment (see this wide pallet of concrete color choices), and will result in a uniform color that can be duplicated from batch to batch. Topically applied colors are achieved through the use of specially mixed, acid-based concrete stains, which must be carefully applied after the concrete has cured. 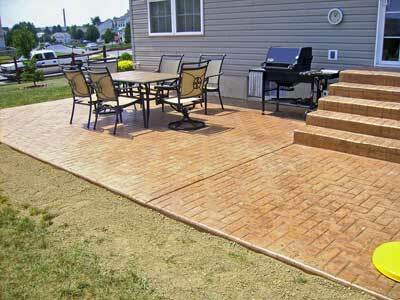 These stains allow for more customized, variegated color combinations. 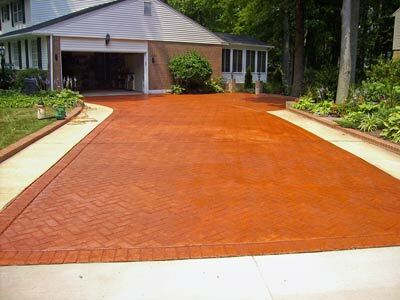 It is possible to apply a color stain years after a concrete driveway, patio or walkway has been installed, bringing new life and a new look to an old installation. However, the end result will only be as good as the existing surface. Please refer to our downloadable document Recommendations Do's and Don'ts for Successful Concrete Color Staining. Colored hardening agents may also be applied to the surface of newly placed concrete floors or patios. When professionally applied, these agents absorb moisture from the fresh concrete and produce a chemical reaction that monolithically bonds the hardening agent to the concrete surface. The finished surface is harder and denser, and can increase the surface strength by up to 75% for standard 4" thick applications. As seen in the photos on this page, a popular complement to stained concrete is concrete stamping. Stamping wet concrete creates texture in the surface of the concrete. When combined with color stains, stamping or imprinting the concrete helps produce a more natural looking surface for floors, driveways, patios, and courtyards.